There’s nothing magic about state boundaries. So why not change them now? It is either a brave person or a fool who claims that something will never happen. But in this case, it seems fair to be so absolutist in predicting we’ll never see a breakaway state created by splitting an existing state into two, even though there are occasionally – and particularly at present – vocal minority groups calling for the creation of new states, primarily on the west coast. There are also moves by some states to secede from the US, and that too is something we view as improbable. Let’s look at both these scenarios. In all the west coast examples, what we see is a minority group of people wishing to create a new state out of some part of a current state (California, Oregon, Washington), or perhaps out of some part of several states – part of CA and OR combined to make a new state, or part of OR and WA, or whatever. 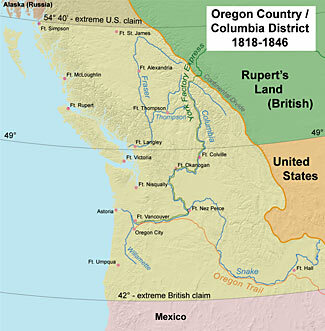 Examples of this include proposals for new states to be called Cascadia, Jefferson and Lincoln. In all three cases, each state has a very stark split between a conservative rural population and a liberal city population, with the liberal city populations dominating both the state legislatures (sometimes even to the point of having super-majorities) and the senators who are sent to DC (all six senators from these three states are Democrats). In addition, the three current states award all their electoral college votes to the candidate winning a majority of votes, unlike some states that award electoral college votes proportionally to represent the popular state vote, or by congressional district. California currently has 55 votes, Oregon has 7 and Washington has 12 – a total of 74 votes between the three states which are safely awarded in their entirety to whoever the Democratic Presidential Candidate may be. Due to the strong Democrat majority in all three states, Republican voters have little or no say in either state or federal elections (other than for House of Representatives members) and feel disenfranchised, with their states increasingly taking positions that are further and further away from their own views. And because these people are not evenly distributed through the state, but rather are geographically concentrated in certain regions, it is understandable why they would feel alienated from the current concept of their state and seek to create a new state to better represent their values. It is possible we might see new states added (Puerto Rico in particular), but the political balancing required to split existing states into two is unlikely to ever work, for the very simple reason that doing so will upset the political balance. In the past, there have been some accepted splits (Vermont out of New York in 1791, Kentucky out of Virginia in 1792, Maine out of Massachussetts in 1820 and West Virginia out of Virginia in 1863) but the most recent of those is 150+ years ago and well before the political balance coalesced so clearly into two bitterly opposed camps. Think about what would happen if, for example, California split in two, with the result being a new state that solidly votes Republican and the remains of original California still continuing to vote solidly Democrat. At the national level, there will be little change in terms of how members of the House of Representatives are selected, because that is based more on population than on state lines, but in the Senate, an additional two seats have been created, and they will be almost surely filled by two more Republicans. In addition, the solid bloc of 55 Electoral College votes has now been split in two, diluting the Democrat advantage in Presidential elections. What Democrat would willingly support a move that would see two more safe Republican senators added to the Senate, and to siphon off some of their safe electoral college votes? Never mind notions of fairness and what is honorable and just. Simple politics will override such concepts, and all Democrats will unite to prevent that happening – both at state and national levels. So there is the paradox – a state that is dominated by one party will never ‘commit political suicide’ by enabling the minority to create their own additional state and to gain a voice over their region and in the national political forums. To be even-handed, if there were also a move to divide a firmly Republican state in two, we’d expect the same behavior to be exhibited by the Republicans! This makes it relatively easy for entirely new states to be added, but the restrictive provisions after the first semi-colon requires that creating an additional state out of parts of one or more states requires both the agreement of the affected states and of Congress too. So even if, as at present, the Republicans control both houses of Congress and the Presidency, the fact that at the state level the affected states are controlled by Democrats means that splitting a state will never happen. There is, however, a very scary thought. What say instead of a Republican controlled federal government, we had Democrats in control. What would prevent a large state such as California from credibly saying “We’re too big, we feel that it would be fairest for us to reduce in size to something more similar to other states”, and then gerrymandering the border split so that both the new states remained strongly Democrat? The state legislature would happily vote for that, and so would the federal government, and the net result would be two more Democrat senators appointed. Would a State Secede From the Union? The other thing we’re seeing renewed interest in, during the Trump Presidency and the ever greater divide between his political views and those of certain Democrat-dominated states (yes, California, we’re talking about you) is a move from simple state defiance of the federal government (the ‘sanctuary’ nonsense) to a desire to leave the union entirely. In California’s case, there are certainly many rational reasons for seeing this as a possible move and expecting the new nation to be viable. They have plenty of coast and deep-water ports, they have all the infrastructure they need, they have a large land mass (if a separate state, it would become the 59th largest in the world, smaller than Iraq and larger than Paraguay), population (it would become the 35th largest, smaller than Sudan and larger than Poland), and economy (if a separate state, it would be the sixth largest in the world – smaller than Britain and larger than France). But the political implications are very complex in such a case, and there’s an amusing paradox for the Democrats to consider. If they were to abandon the US and secede, they’d be weakening the Democratic base for the rest of the US. Two fewer senators, 55 fewer electoral college votes, and a varying number fewer Congressmen. So, Californian Democrats have to ponder – is their hate for Trump, who will be in office for at most seven more years – so great that they’d be willing to turn the rest of the US more strongly Republican by leaving the union? Or, in the interest of keeping the nation as a whole more strongly Democrat, will they tough out the balance of Trump’s first and possibly second terms? There is also the fact that if California decided to secede, that would change the equation for the more conservative parts of the state. They would no longer be trying to split a state in two; instead, they would be part of a separate nation trying to be accepted into the US instead, and that no longer requires the consent of the rest of the nation they in turn would be seceding from. Note that back in the Obama days, a number of primarily Republican states also grumbled about seceding, although of course nothing ever came of it. Can a State Secede From the Union? The preceding section ignored an important question – could a state ever secede from the union? Surprisingly, the Constitution is entirely silent on this point. As far-sighted as its drafters undoubtedly were, they clearly never thought that a state, once joining, would ever want to leave again. When, therefore, Texas became one of the United States, she entered into an indissoluble relation. All the obligations of perpetual union, and all the guaranties of republican government in the Union, attached at once to the State. The act which consummated her admission into the Union was something more than a compact; it was the incorporation of a new member into the political body. And it was final. The union between Texas and the other States was as complete, as perpetual, and as indissoluble as the union between the original States. This quote is accurate, and is shown on page 726 of the Court’s decision. But whenever you see a quote, you should always go to the source, and read it in context. In this case, there are three points of note. The first is the nature of the case itself. It was primarily about the ownership of some bonds and whether the state of Texas lost or retained ownership of those bonds during its period of self-declared independence and the Civil War. The nature of the state’s potential for independence was possibly secondary to its bond ownership and obligation, and whenever a Court comments on something that is outside of the direct purview of the case, those comments become known as ‘obiter dicta’ and don’t bind future courts and rulings. It is debatable as to if the above paragraph is obiter or part of the binding decision, but anything that is debatable can indeed be debated, and the Supreme Court has managed to come up with new opinions and policy reversals on much weaker grounds in the past, when it chooses to. The second point is that there is another sentence in the same paragraph that was quoted above. That sentence adds an important exception to the preceding global assertion. There was no place for reconsideration or revocation, except through revolution or through consent of the States. So, even though the judgment started off by asserting the permanent nature of the union of states, it also countenanced two mechanisms – neither clearly defined or explained – that would allow states to secede, albeit one of them a mechanism which required the concurrence, in some form, of some number of the other states in the union. It is also relevant to note that the concept of the word “revolution” is far from clear. We’re in an age of ‘peaceful revolutions’ that have occurred throughout Europe; a revolution may as likely be a sweeping tidal wave of public opinion on a matter, without requiring bloodshed, and without also requiring the concurrence of some external authority. The fact that revolution is cited as a separate means for secession would imply the Court understood that revolution does not require ratification by Congress or the other states; but we are not told what would constitute a qualifying revolution. The third point is that this was not a unanimous decision of the Court. It was a majority decision, with five justices agreeing and three disagreeing. While the majority rules, the dissenting judgments by other justices can often be used in subsequent court cases to ‘distinguish’ cases from previously decided cases and to support overruling future cases. There is plenty of material in the dissenting judgments, should any future court be so minded. A combination of the paragraph possibly being considered as obiter dicta, and the dissenting opinions provides future courts with plenty of rich opportunity to rewrite this finding. So, while the simple answer to the question ‘can a state secede from the union’ is usually given as an emphatic ‘No!’, the actual answer is more nuanced. Clearly, through some sort of peaceful process and with some degree of acceptance by the remaining states, secession is possible, and similarly, whether it be peaceful or not, revolution could also result in secession. Our feeling though is that these days there will never be sufficient consensus within a single state to create the overwhelming groundswell of opinion and popular support for a secessionist movement to be successful. While there are some genuine and ardent supporters advocating either carving states up into additional states or simple seceding from the union as a whole, the number of such people have never risen to any appreciable percentage of the population. Until there is a real true public demand for such actions, of course no such thing will occur, and indeed, even if the supporters of such a move become broader based and more vociferous, the extremely contentious nature of such actions are likely to see nothing happen.